Welcome Package: $5 + 20 free spins upon sign up (no deposit required), 300% deposit match bonus on initial deposit + 100 free spins. Games: 75-ball and 90-ball bingo, free play bingo, turbo bingo, keno, pokies, progressives, roulette, Internet scratch cards (instants), and video poker. Lucky Pants is one of our top recommended online bingo sites for housie enthusiasts looking to play on the Web. The sister site of Kitty Bingo, it hosts high-quality bingo games, with a clean and colourful menu aesthetic that makes navigating and finding games simple for players from all ends of the spectrum. Along with 75-ball and 90-ball bingo, Lucky Pants offers a ton of real money mini casino games, like keno, slots, progressives and scratchies. 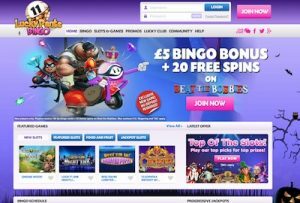 Lucky Pants’ lobby of 25+ online bingo rooms and 120 + mini games are playable without needing to download software – they’re all instant play-enabled for Web browsers. Registration for an account at Lucky Pants Bingo is free, so players can examine the site, play the games in practice mode and warm up to depositing some funds for real money games. To sign up, you must provide your full name, date of birth, post code and your contact details before proceeding to choose an alias. You must also choose your preferred currency upon sign up. Once your account is set up, Lucky Pants will send you an email to your provided address. It will contain a link which you need to click to verify your account and begin playing. One of the first things new visitors will notice about Lucky Pants Bingo is the incredible number of bonuses, competitions, promotions and member rewards offered to their players on a consistent basis. Daily, weekly, monthly and special offers are on hand for every type of player – taking advantage of these is recommended to get the most out of your Lucky Pants experience. Welcome Package: Sign up for an account at Lucky Pants Bingo and receive £5 free + 20 free spins just for joining – no deposit required and instantly available once registration is complete so new players can try out the site’s online bingo games and various mini casino games before committing to funding accounts with real money. New players will definitely want to take advantage of the second half of the Lucky Pants Bingo Welcome Package: once you proceed to funding your account with an initial deposit, you can look forward to a 300% match bonus and 100 free spins – up to a maximum of £50. So if you deposit £50, you can look forward to £150 free cash to play with along with 100 free spins to use on Internet slots mini games. Note: The Lucky Pants £5 welcome bonus can be used in Newbie, Lucky Stripes, Red Hearts and After Dark bingo rooms, and the free spins are valid for 24 hours from sign-up completion. Any unused bonus will expire after 3 months. All free spins are spread out and credited 20 spins a day for 5 days. Lifelong Cashback: Every member of Lucky Pants Bingo is eligible for cashback for life, meaning you will receive a minimum of 5% cash back on all bingo deposits credited to your account every week on a Friday, with the percentage determined by your membership VIP level on the site. Re-Deposit Bonus: All players can take advantage of a 25% or 50% match bonus on all re-deposits for as long as you are a member of Lucky Pants Bingo. You can choose which bonus by visiting the cashier and selecting it from the dropdown menu when processing your deposits. A 25% bonus applies to deposits of $10 – $20 while the 50% bonus applies to deposits of $30 – $100. Refer-a-Friend: Get a friend to register an account at Lucky Pants Bingo and when they’ve deposited and wagered a minimum of $10, contact the operator’s support team with both of your usernames. The site will top up your accounts with a $15 each in bingo bonus credit. This offer can be claimed up to five times by one user. Does Lucky Pants Bingo support real money? Yes, the site supports real money deposits in several currencies. Lucky Pants is primarily marketed towards the European market and this is reflected in its promotional banners, but upon registration, you can select from the drop-down list of currency options as your preferred option for funding your account and playing real money housie with. Lucky Pants Bingo supports deposits and withdrawals through a number of services, including MasterCard and Visa credit and debit cards and e-Wallets such as Neteller. All fund transfers are encrypted and secure, using P128 SSL Digital Encryption technology to protect financial information and transactions. Lucky Pants Bingo offers both 75-ball and 90-ball online housie games for players. In 75-ball, players must fill the pattern displayed on the side of the Lucky Pants interface to win. In 90-ball, players must cover five numbers in a line to be a one or two line winner, or cover all 15 numbers of a ticket to win a full house. Hitting bingo ends the session ends in play, and multiple people who hit bingo are instantly awarded their share of the prizes. Players can remain in the same room while the next game loads, or can exit to the bingo lobby to proceed to the members area or another game session. In all bingo rooms, a chat bar exists for socialising with other real players, or asking members and staff for help if you need support. 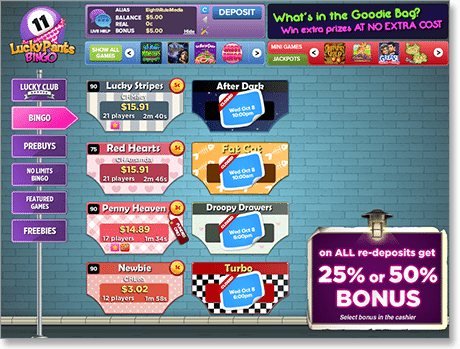 Lucky Pants hosts a ton of bingo rooms for a range of different player bankrolls, moods, skill levels and timetables, such as After Dark, Fat Cat, Lucky Stripes, Newbie, Penny Heaven, Polka Dots, Red Hearts, and more. Bolstering the standard bingo rooms are daily, weekly and monthly No Limits Bingo games and pre-buy progressive jackpot 90 Ball Spin Cycle and 75 Ball Spin Cycle games. 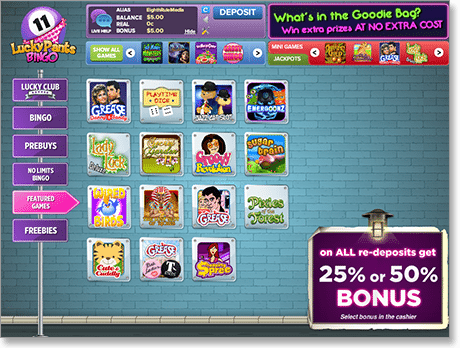 If you’re in the mood to win some extra cash on mini casino games such as video pokies, these titles are readily available at the top of the bingo hub window interface so you can load and get into the game directly from there. The 120+ non-bingo mini games on Lucky Pants Bingo come from several renowned casino game developers, such as Bally Games, Daub Games, Eyecon, IGT, and Microgaming. A ton of online video pokies are available, along with a fun roulette table game, progressive jackpot slots and colourful instant scratch cards. Lucky Pants even host their own branded video slot and progressive jackpot with the same cheeky aesthetic the rest of the site holds. *Be sure to fund your account, as side mini casino games are only playable with real money or free spins. If you do need additional queries answered or find yourself confused, the customer support of Lucky Pants is prompt and extremely helpful. The Live Chat option in particular has Lucky Pants representatives respond to your query within moments of clicking the ‘Support’ Button (located on the top bar of every page) and loading the support interface. Lucky Pants Bingo’s friendly atmosphere means many games are very social and fun, and we found many games to be more enjoyable thanks to the amusing and helpful support staff who sit in on games, and the other long-time players who are extremely welcoming to newbies. Register at Lucky Pants Bingo for top quality online housie and get £5 and 20 free spins simply for signing up, no deposit required.